Chris Potter has long been touted as one of his generation's most talented performers. Even as a teenager, well before he moved to New York, he was named an heir to the traditions of Charlie Parker. In spite of the praise, Potter has been a self-driven individual striving to satisfy his own preoccupation with music. Music was a constant part of Potter’s life growing up. He was born in Chicago, but by age three he moved to South Carolina. He grew up in the south, but the influence of the big city remained in his household. His family had a "quality record collection” including, among others, Bob Dylan, Buddy Guy, and the Beatles. These became Potter's earliest influences. For Potter listening was never enough. He was interested in creating music. "I always had to play it." Whenever his family went somewhere where there was a piano, he had to noodle around on the instrument. He would figure out the melodies he'd heard on records being played at home, but Potter was also keen to figure out his own ideas, improvising long before he had any formal training. As he got older, he discovered the more obscure parts of his parents' collection: Miles Davis, Charles Lloyd, and Dave Brubeck. Potter says it was the tone of Paul Desmond's saxophone on the Brubeck Quartet's legendary album Time Out, which inspired him to take up the instrument. By the age of thirteen he was already becoming an acclaimed musician, praised by renowned jazz educator Jamey Aebersold as a "reincarnation of Charlie Parker." At one particular Aebersold camp, he was singled out to play with the instructors instead of his peers, as they saw him as a player on their level. Looking back on it, Potter recalls it being "a little weird. The Charlie Parker reincarnation thing kind of freaked me out. There was another one of the teachers that asked me about it in private once, and I told him ‘I have no idea whether it exists or not. I certainly have absolutely no feeling that I was Charlie Parker in a previous life,’ and he said ‘yeah it’s probably just a bunch of junk, but if you are Charlie Parker, don’t take drugs this time.’"
After three or four years in Rodney’s band, Potter began to work around New York in other capacities as well. He was still just twenty-two when he began playing in the Mingus Big Band. One night, Steely Dan's Walter Becker happened to attend a performance and loved Potter's playing enough to seek him out for the upcoming Steely Dan tour. Suddenly, Potter was thrust into huge performance venues playing for thousands of people a night. He remembers one of the interesting things about his experiences in that group was, while the band was extremely experienced, Donald Fagen and Walter Becker, the group's leaders, hadn't toured since 1972. They had since scored a number of hit albums and singles and amassed a large fan base, but they had always stayed in the studio up to that point, and they looked like "deer in the headlights" performing for such large numbers of people every night. It was the leaders who were stunned. When he was given the chance to make his first album, it was an all-star effort, featuring Jack DeJohnette, Dave Holland, and John Scofield as his sidemen. He hadn't even played with Holland before and was pleasantly surprised to see that they all showed up for the session. "I remember I was flying in from somewhere else and I was late, so those guys were sitting around for hours waiting for me. I was completely terrified for about five minutes and then we started to work on the music, and I realized it’s just like playing with my friends. We’re looking at the tunes. We’re trying to figure out what’s the best form, what should we do with the solos, what kind of feel, just completely working on the music, no weird stuff at all. It just felt completely at home. It wasn’t foreign at all. It was just a guy trying to figure out what’s the best part to play on this tune, and it just happens to be John Scofield and he has a tremendous amount of experience and a real unique voice, but that doesn’t help him when he just walks in and he’s trying to figure out what to play. He has to sit there and figure out what to play just like anyone else." Potter's journey follows one of those unique routes. He has been a consistent figure in jazz for nearly twenty years, garnering great admiration even as a teenager. He continues to churn out memorable performances, and as his obsession with music continues, there are sure to be many more in the decades to come. Yeah, but I could play like that if I had his talent ! 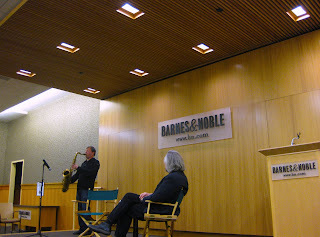 Every Friday, Dr. David Schroeder, Director of the NYU Steinhardt Jazz Studies Program, hosts an interview series with prominent figures in the jazz community at Barnes & Noble's 86th Street location in New York City. This blog provides information about upcoming interviews and includes synopses of past events in the series including audio clips from the interviews.